Juicy Booty playing at Fly Casino is a new progressive Jackpot slot with 5 reels and 25-paylines. This new slot has a lot of special features and great bonuses for you to enjoy. It will take you several spins to get used to the reels, but thereafter you’ll love the game! You can win anywhere from 5 to 50 Free Spins when three or more of the Scatter Symbols appearing anywhere on the reels. Plus, there is an awesome Fruit Slice Feature that can randomly trigger during normal play giving you BIG winning combinations. 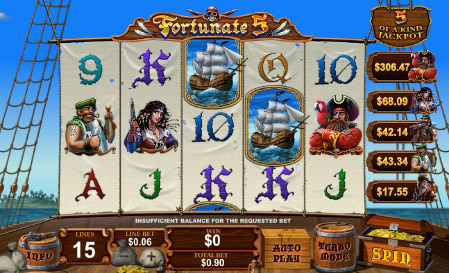 Fly Casino is thrilled to release Fortunate 5! 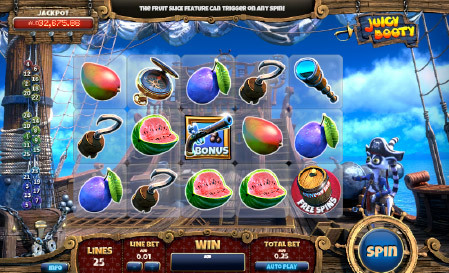 This slot at Fly Casino takes you on a multi-progressive pirate adventure on the open seas. This 5-reel, 15-payline slot has free spins and second chance re-spins which give you another chance to win one of 5 progressive jackpots! The reels are filled with progressive pirates, a skull and crossbones symbol and a pirate ship. It’s great to play and you with just a little luck, you have an awesome chance at winning any of the five progressive jackpots. 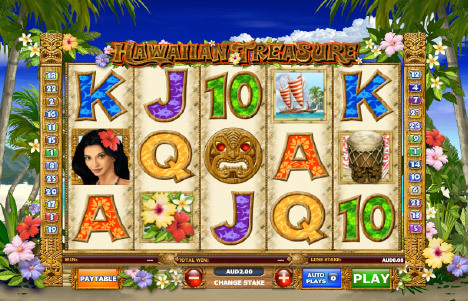 Hawaiian Treasures Slot at Fly Casino is a 5 reel, 25-line game. As you enjoy all of the sites and sounds of Hawaii, what you really want get on the reels are the wooden face mask symbols. This symbol acts as the WILD symbol and the SCATTER bonus symbol. Spin three or more wooden mask symbols for 12 FREE SPINS! A classic video slot, with a wonderful theme and a great bonuses. VALUE MONDAY! From 00:00GMT until 23:59 GMT, all members are invited to receive a 115% bonus up to 115.00 on your deposits of $/£/€10 or more.